I want to thank all the bloggers who took part in this challenge. I was not going to take part, but Paula was going to have her ingredient list ‘orphaned’ so I decided to participate. I love making food with a random set of ingredients and so this challenge is a pleasure for me. 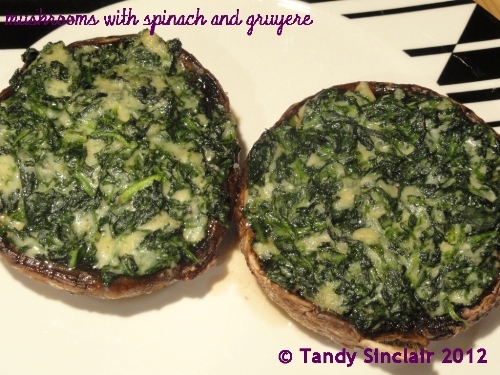 Paula challenged me to use the following 7 ingredients and so I made Mushrooms With Spinach And Gruyere. For starters I decided to do a turnip and spinach soup. My side dish for the main course was easy to prepare. I chose the biggest portabello mushrooms I could find and I chose a locally manufactured Gruyere cheese. The cheesery is less than 100km’s from us and they make a really nice selection of cheeses. I added the rest of my spinach to these and came up with a really good side dish, which could be served as a starter. Yes, one of my favourite combinations. Love stuffed mushrooms – bet these were tasty!